A Texas Senate panel considered legislation Tuesday that would require construction companies to give workers mandatory rest breaks — an effort to prevent illnesses and deaths from the sweltering Texas heat. Senate Bill 473 would require 15-minute rest breaks for every four hours of work on construction sites across Texas, where heat is typically linked to at least a handful of workplace deaths each year. “I think this is a simple, fair-minded proposal to keep Texas construction workers safe,” said Sen. José Rodríguez, who authored the bill with fellow Democrat Sen. Sylvia Garcia, at a hearing of the Senate Committee on Natural Resources and Economic Development. The bill would seem to be a long shot in a Republican-controlled Legislature that often hesitates to tighten regulations on businesses. A similar proposal drew no hearing during the 2015 legislative session. But members of both parties took interest Tuesday — particularly following the testimony of the 13-year-old sister of a North Texas construction worker who died from an on-the-job heatstroke in July 2015. “It’s not right he had to die like that,” said Jasmine Granillo. “Roendy’s death was preventable." Roendy Granillo was installing a hardwood floor in Collin County when the hot summer sun made him sick. The 25-year-old asked his boss for a water break but was denied, his family says. He died hours later. Granillo’s death was among those cited when the Dallas City Council voted in late 2015 to require 10-minute breaks every four hours. Austin is the only other Texas city to mandate breaks at construction sites. Federal law does not require employers to give such breaks, but laws in 12 states do, said Emily Timm, deputy director of the Austin-based Workers Defense Project. Texas workers across industries, however, are not even legally entitled to meal breaks. In 2013, a survey by the Workers Defense Project and the University of Texas at Austin estimated that 39 percent of Texas construction workers don't get rest breaks. About 15 percent of those surveyed reported seeing a coworker faint in the heat. “This is a Texas-specific problem, and we believe this is a Texas-specific solution,” Timm said of the bill. 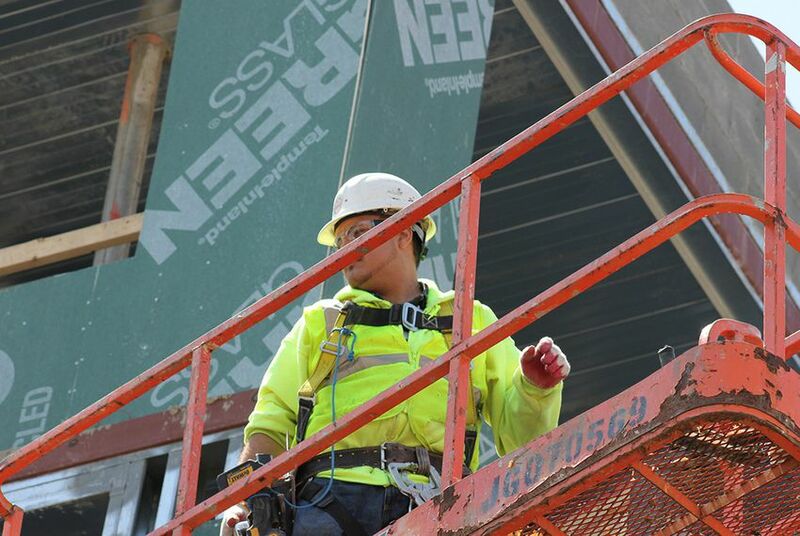 Homebuilders call such policies burdensome and difficult to enforce, and they suggest that workplace safety falls more squarely in the domain of the federal Occupational Safety and Health Administration (OSHA). He added workers might naturally get breaks throughout the day — while waiting for materials, for instance. But lawmakers in both parties questioned whether OSHA, which has long been criticized as short-staffed and unable to sternly punish employers who skimp on safety, could do much to prevent heat deaths — particularly since the agency has no rest break rules. Under the legislation, workers denied breaks could officially complain to the Texas Workforce Commission, which would investigate — and potentially levy penalties — through the same process it handles wage disputes. Estes, who worked in construction while he was younger, told The Texas Tribune that has was “sympathetic” to Tuesday’s discussion but he has not taken a position on the bill. Aiming to prevent heat-related deaths and illnesses, the Dallas City Council approved a measure requiring construction companies to give their employees a 10-minute rest break every four hours. The number of people killed on the job in Texas increased in 2014, and the state retained its grim spot as the county’s leader in workplace deaths. Federal workplace regulators have slapped three construction firms with penalties totaling nearly $800,000, saying that the companies “put workers in tremendous danger” in Houston-area accidents.